Not only did Israel occupy the West Bank and the Gaza Strip after 1967, it also began to colonize it. In July 1967 – more than a month after hostilities had ceased – former general and at that time Minister of Labour Yigal Allon presented to the government a first initiative in this regard. In broad outlines, the plan entailed that Israel annex a strip of land 10 to 15 kilometres in width along the River Jordan, as well as the region south of the river, stretching to Jerusalem. The same applied to the southern part of the Gaza Strip. In the annexed territory, Israeli settlements were to be built in order to consolidate Israel’s claims, especially to the area around East Jerusalem. On the basis of this plan, a third of the territory in the West Bank and about half of the Gaza Strip would eventually be annexed by Israel. Initially, emphasis was placed upon military strategic arguments in order to justify events (‘Israel’s wasp waist’, ‘the need for strategic depth’), afterwards, religious ideological (Biblical) claims started to dominate. 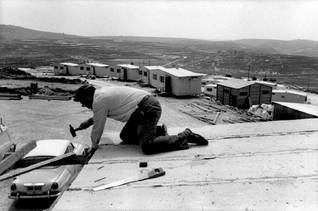 In accordance with the Allon Plan, Israeli settlers moved to the West Bank after 1967. Fanack offers a special file on Israeli Settlements.